When this project started back in May 2011, I sat down and read a stack of cases from Bruce’s 4190 Operations Planning course. The cases were all focused on pj’s restaurant and the restaurant operations course. The cases provided analysis of the operation and gave recommendations of future ideas and changes that could be implemented to the establishment, the course, and the operation as a whole. When reading the cases I made and created quite the list of ideas that the 4th year students came up with. I also added my own ideas and thoughts to this list and it turned out there were at least 3 pages long of ideas about pj’s for the future! Since May there has been a ton of new changes to the course and the establishment. 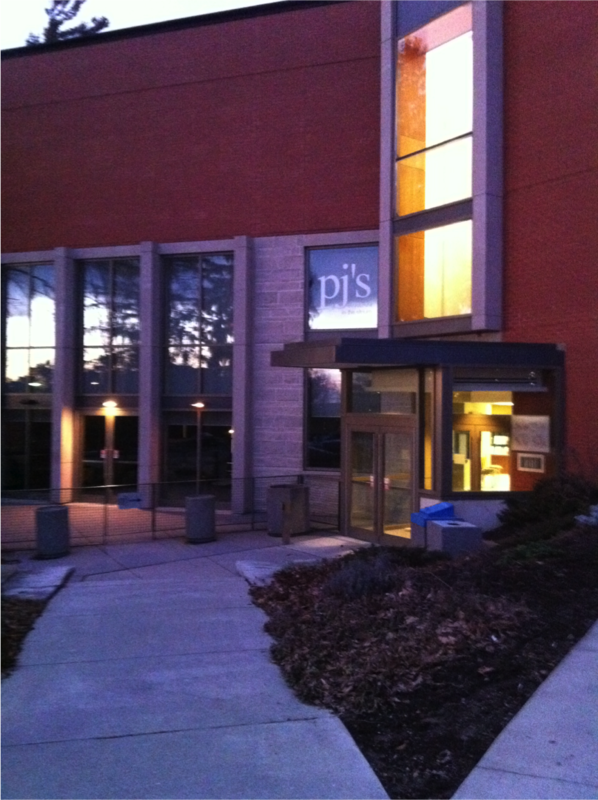 If you knew pj’s before this 2011/2012 school year you would see that small and large effective changes have been made! I took the restaurant operations course in the fall of 2010, as well as the advanced restaurant operations course in winter 2011 and I am happy that I have been involved and surrounded by change and was given the opportunity to see them play out first hand. Let’s start at the beginning with one of the major curriculum changes that was organized through out the summer, the incorporation of nutritional software to calculate good/bad fats, sodium and calories. In the fall the students were responsible for calculating their special menu items nutritional content. They had the choice to incorporate it on their menu alongside the rest of pj’standard menu items nutritional content printed on the menu for the guests to read. This new curriculum will be reoccurring this semester and will remain a staple now within the course. This major change has been so important for the course and for our students to understand the importance of nutritional content in menu engineering. Next we have the new washer and dryer at pj’s. Faculty members at the University of Guelph, did their research and saw the return that a washer and dryer would give the school instead of renting linens every week. The cost of renting linens is very expensive to maintain each week and washing pj’s own linens would reduce the cost of renting and achieve the goal of not having to rent linens at all. Not renting linens also means a delivery truck does not have to make its way to pi’s every week which is a big green house gas savings! Pj’s has now purchased linens for both restaurant operations and advanced restaurant operations classes. Also purchased for the restaurant is 100% recycled paper, a very green option, to put on the tops of the tables during lunch service to reduce the amount of tablecloths that have to go through the wash. Before linen napkins were purchased for the restaurant, paper napkins were used that were made of biodegradable materials but were bleached to achieve the white colour, information that was researched. Purchasing the linens was the new green option, providing no waste to landfill and an environmentally friendly and cost-effective route. Now served at pj’s is fair-trade shade grown coffee supplied by a local roasting company, Planet Bean who are known for their commitment to both environmental and social sustainability, http://www.planetbeancoffee.com/. After the coffee is brewed the grounds are collected from the coffee and composted after service. More local products have been purchased at pj’s like local beer and wine, and some local produce that is incorporated into the student’s menus when possible, like in the advanced restaurant operations class. Last year it started where us students needed to use a local item and incorporate it into one of our dishes. My partner and I choose local mushrooms from Guelph, which we exposed to our guests and provided awareness of local products that they may not have known before. Not only are local products used but also there is now a permanent menu with daily specials that the students create. A standard menu was created and is re-used each service with the addition of the specials on each table. This has reduced waste from when there was a different menu everyday. New changes to the menu this semester is that the standard menu items have gone down in cost due to a new combo option. Pj’s has created 4 sides available to accompany any of the entrees for a combo price and reduced the prices of the individual entrees on their own. This new menu helps reduce waste that goes from uneaten food, controls and reduces food costs and helps with the control of portion sizes. If there is food to be taken home though, there is the option of recyclable take-out containers instead of Styrofoam that were purchased this summer and given out by request. Just from my own personal knowledge, as a student who eats on campus frequently, pj’s is now one of the most cost friendly places to eat on campus serving up high quality and delicious food! On top of these major changes from this past semester pj’s acquired a new dishwasher, took part in a water audit, eliminated bottled water for 4 semesters now, stopped providing straws with beverages, is inquiring into more energy-efficient equipment, uses natural day-light during lunch service instead of the lights when possible and is continuously used as multi-use space on the regular! Pj’s new look is worn well and with pride! It’s not going to stop here though, be prepared to see more change and growth this semester. For instance the students will be working on a life cycle analysis (LCA) this semester for components in their standard menu items. The students will have to pick a protein, vegetable, grain or dairy product that is incorporated in their menu item and complete a LCA for 2 of the items by looking at production, processing, distribution, retail, cooking, consumption, and post consumption. Look here to learn more about it in the near future. Previous Previous post: Weighing in on Wine… Is your bottle too heavy? Next Next post: The word Sustainable…..